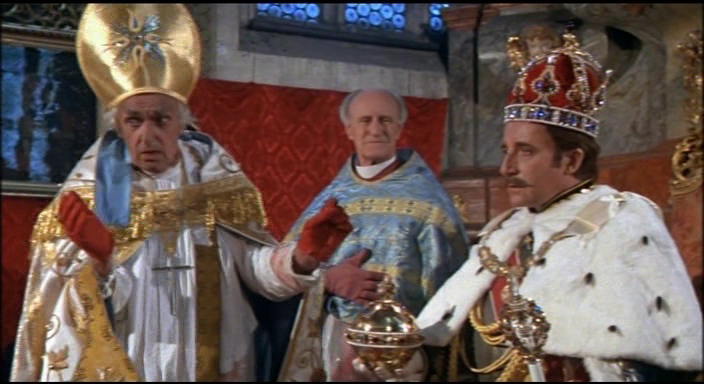 I saw the comedy PRISONER OF ZENDA as a kid, having enjoyed Peter Sellers in many things, and found it curiously lifeless, almost totally lacking jokes, and didn’t think of it again for years. Only when I got interested in Richard Quine did the film seem worth revisiting. Quine killed himself after making it. Could it really be that bad? * Well, the guy had some hard things in his life, and it would be unfair to blame the strain of working with Sellers, or Clement & La Frenais’ script, at least not entirely. Those prolific TV writers always did better at sitcoms than they did on the big screen, though OTLEY is mildly amusing. The absence of comic bite here may be more to do with productorial (or actorly) interference that with any lack of inspiration on their part, who knows? I don’t have Roger Lewis’s splenetic Sellers bio to hand to check what he says about it, but the way the cast is peppered with previous leading ladies from PINK PANTHER films (Elke Sommer AND Catherine Schell?) and Sellers’ lovely young bride Lynn Frederick, suggests that he was very much running the show. There’s a fundamental flaw in this kind of thing — by which I mean the comedy in which an ordinary, decent man of the people is thrust into a position of great authority — see also DAVE and THE POPE MUST DIE. While it has an agreeable whiff of wish-fulfillment, it offers no real chance of laughs. The OTHER parody of Anthony Hope’s Ruritanian romance, ROYAL FLASH, released just four years previously, solves this issue admirably: a nice chap suddenly granted power offers no entertainment (unless he’s immediately corrupted) — a rotter granted undeserved license can be pretty good fun. 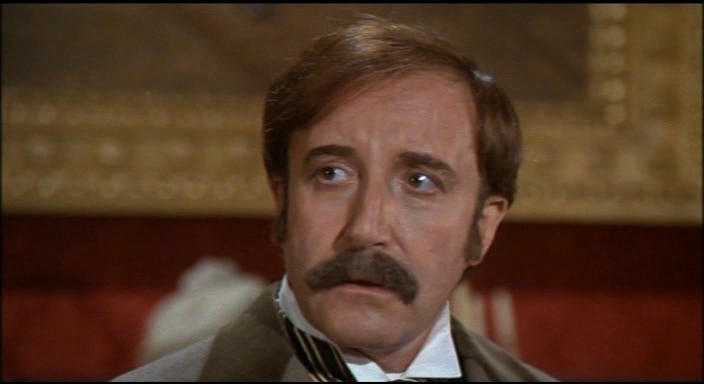 Lionel Jeffries appears as a sidekick/stooge in both films, adding to the deja vu. 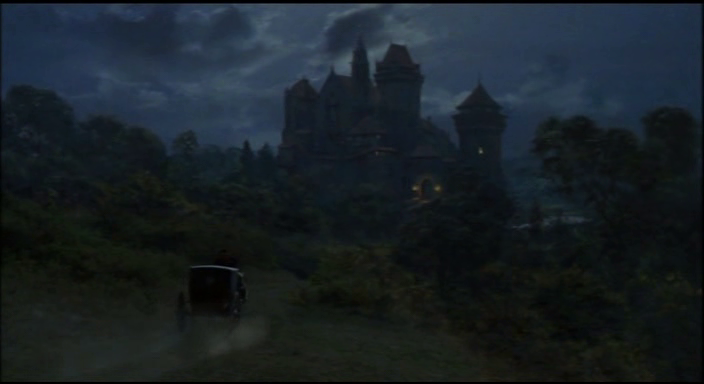 This movie looks lush, but just as as I remembered, it’s curiously devoid of gags. The slapstick is poorly conceived and atrociously executed, though having three roles played by an actor who couldn’t do his own stunts must have been a hindrance. There are shots where PS has to be doubled twice (quadrupled?). Sellers briefly plays the soon-to-be deceased King, plunging from a balloon by the end of the opening credits, in standard old duffer mode. As the effete Prince, he knows some kind of lisp is de rigeur, so in a fit of largesse he confers upon Rudolf V every lisp known to phonetics. Where he intrigues is as Syd Frewin, cockney cab driver and inadvertent doppelganger. A Londoner and a mimic of genius, Sellers has no trouble bringing the outward character of Frewin to life, particularly in terms of accent. It’s pure Michael Caine, and, one is tempted to say, not a Michael Caine impersonation but a Michael Caine performance. Whether because the writers couldn’t think of any jokes (unlikely) or because Sellers rejected them all (quite possible: his starry misbehaviour took perverse forms), Frewin has almost no comedy to work with. So Sellers simply plays him as heroic: the lumpenproletariat leading man, body language of a stoic, stolid, squat waddler, but an embodiment of honesty, courage (never even thinking to be afraid or doubtful) and unassuming nobility. The obvious irony is that Rudolf V is a pratt, but his impersonator has all the qualities of a true king, though socially he’s from the gutter (the script throws out a broad hint that Frewin is actually an illegitimate brother to Rudolf, but does nothing with this). None of this helps make the film a successful comedy, and Quine is more concerned, it seems, with opulent interiors and the odd swooping crane shot than with conjuring laughs out of this soggy confection. But something about the honest of Syd Frewin remains oddly touching. The way he holds himself. A staunch, baggy dolt with a good heart. *The true suicide risk Quine movie is OH DAD, POOR DAD, MOMMA’S HUNG YOU IN THE CLOSET AND I’M FEELING SO SAD, a studio-butchered abomination that might cause self-slaughter among the audience, let alone the crew. 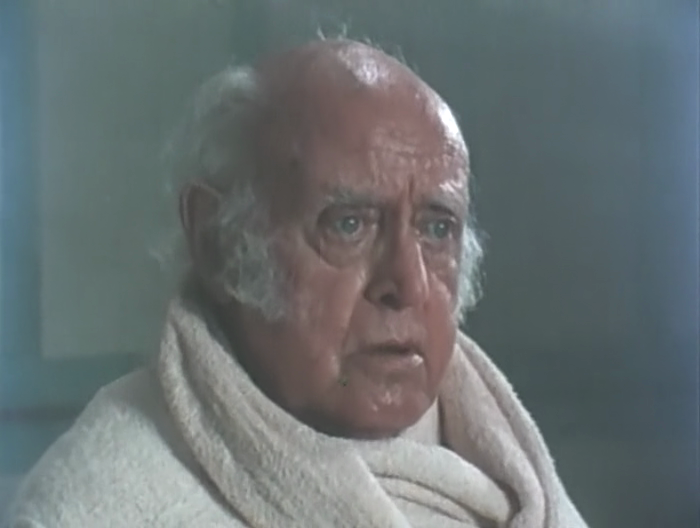 By some strange quirk, the great Edinburgh-born actor Alastair Sim seems to have spent most of his later career in the sauna. In the subject of this fortnight’s edition of The Forgotten he appears in two scenes, steaming himself in both. 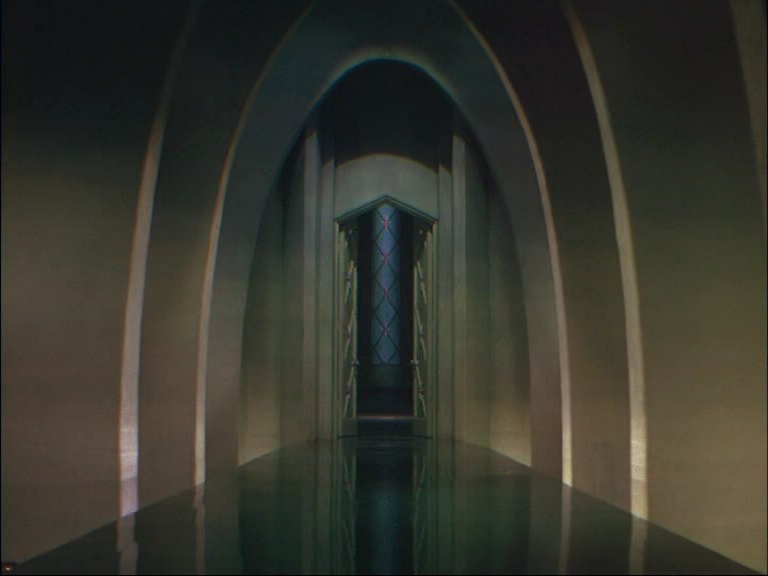 In ROYAL FLASH he also appears in two scenes, one of which is a magnificent Victorian Turkish bathhouse designed by Terry Marsh complete with a foot-pedal-powered brass shower for Malcolm McDowell to enjoy. Sim’s character, fully dressed in gentlemanly finery, does not look like he’s enjoying himself quite so much. One the DVD commentary, McDowell reports meeting Sim again when he went to loop a few lines. Sim looked exhausted. “I wish I could just say a line,” he moaned. The actor had, by this time, become such a master of the stutter, the hesitation and the silent working of the jaw, that replacing a line became torture, because the words never came out in a straight line. His talent was also his torment. I should think the hardest actor to loop would be Leonard Rossiter, though, who developed a level of wordless chuntering even more extreme than Sim’s — particularly on the sitcom Rising Damp, Rossiter would flap his gums soundlessly, or else accompanied by a high, hesitant drone like a distant mountaineer plummeting, waiting for the words to actually form, for a long time before actual speech emerged, and part of the comedy was that you never knew at what point the facial calisthenics and faraway yodel would resolve into language. Lucky, then, that he worked with Kubrick, who tried to avoid dubbing whenever possible, and a little unfortunate that Sim was paired with Lester that one time, since Lester virtually rewrote his films in the dub. But still, it’s delightful to see Sim in a Lester comedy. None of this has anything much to do with today’s column, the Peter O’Toole tribute edition, which is available here. And meanwhile, at Apocalypse Now, The ’68 Comeback Special returns with Scout Tafoya’s take on 24 HOURS IN THE LIFE OF A WOMAN starring the great Danielle Darrieux. 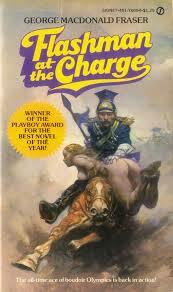 I’ve been reading the Flashman books by George McDonald Fraser. I read the first on the train down to meet Richard Lester, who tried to film it around ’79/’70, only to have it collapse when the studio panicked at the sight of their recent box office takings and pulled the plug on FLASHMAN and Kubrick’s NAPOLEON. For those not in the know: Fraser plucked the cowardly bully character from Tom Brown’s Schooldays and made him the anti-hero of a series of historical adventures in which the ruthless and unscrupulous braggart takes part in every major military campaign and a few other historical imbroglios from 1845 to 1900. These adventures were presented in the guise of true-life memoirs discovered in a tea-chest in a midlands auction house and edited for publication by Fraser — The New York Times was fooled. To give you a clue to Flashman’s horrific bigotry (breaking you in gently), here he is on the Irish question, as he bumps into Gladstone, who’s about to retire, in the men’s room (from Flashman and the Tiger). “Hollo, old ‘un,” says I, “Marching orders at last, hey? Ne’er mind, it happens to all of us. It’s this damned Irish business, I suppose -” for as you know, he was always fussing over Ireland; no one knew what to do about it, and while the Paddies seemed be in favour of leaving the place and going to America, Gladstone was trying to make ’em keep it; something like that. He stood glaring at me with a face like a door-knocker. …the coolies could be seen engaged in the only two occupations known to the Chinese peasant: to wit, standing stock-still up to the knees in paddy-water holding a bullock on a rope, or shifting mud very slowly from one point to another. Deny them these employments, and they would simply lie down and die, which a good many of them seemed to do anyway, I’m told that Napoleon once said that China was a sleeping giant, and when she awoke the world would be sorry, He didn’t say who was going to get the bastards out of bed. Appalling stuff, of course, and only funny in a guilt-inducing, worrisome way. We know GMF disapproves of Flashman, but is it possible to disapprove enough and keep writing? I’d read Royal Flash and Flashman at the Charge and Flashman in the Great Game long ago, but somehow never got around to the first in the series, possibly the best. Dealing as it does with Britain’s first, disastrous Afghanistan campaign, it would have been a rather timely film to have around if Lester had made it when he intended. Part of what leads the Brits into destruction in the book (as in history, Victorian and recent) is their failure to understand the people they are dealing with / killing / civilizing / oppressing. The abortive attempts at this film occurred after THE BED-SITTING ROOM, when Lester’s career was in the doldrums (“Film-making has become a kind of hysterical pregnancy”) and before THE THREE MUSKETEERS, scripted by Fraser, put him back on the map. This led to ROYAL FLASH, which posits Flashman in the midst of a Ruritanian romance based on The Prisoner of Zenda (but cheekily claiming that Flashman’s exploits inspired Anthony Hope’s popular novel). Lester had aimed to cast John Alderton in the first film, but ended up with Malcolm McDowell in this one. 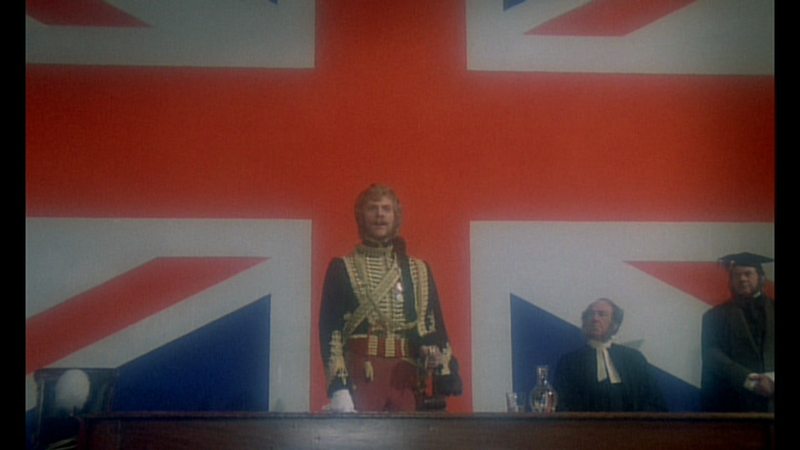 Oddly enough, near the end of Flashman, our villanous hero is laid up in a hospital bed being praised by politicians in a scene which is uncannily close to CLOCKWORK ORANGE if you imagine McDowell in the role. Some have suggested that Harry Paget Flashman is uncastable. 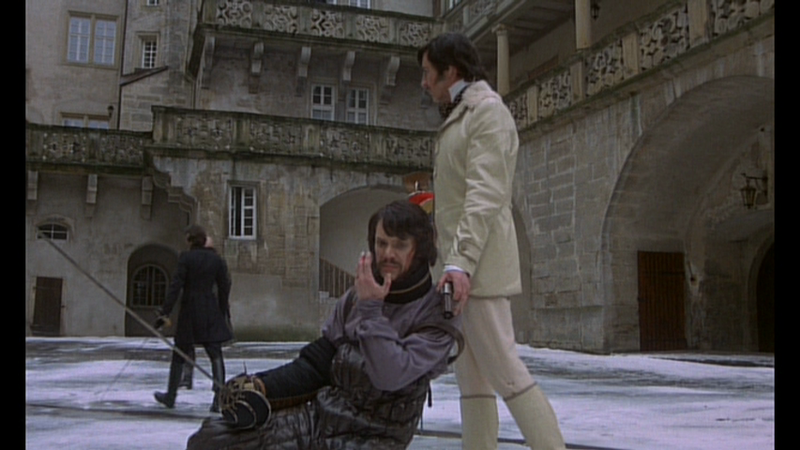 Others proposed that Lester should have slide McDowell into the role of mercenary Rudi Von Starnberg and extracted Alan Bates from that part to cast as Flashman, but Lester disagrees. I think that idea came about because Bates is ideal in his role and McDowell not quite perfectly suited to his (though very funny). To me, the difficulty would seem to be that Flashman is only attractive to readers because he’s so honest with us about his manifold failings and vices, as well as the lunacy or idiocy of others. He has the appearance of a hero — think Errol Flynn, and it’s not so much that he’s particularly cowardly as that where fear makes other men fight for what they believe, Flashman is motivated only by self-interest, so terror pushes him into fleeing, fighting dirty or blubbing and begging — whatever he thinks will work. What makes this funny is the contrast between the heroic expectations engendered by Flashman’s appearance, rank, and the situations he’s in, and what’s going on in his mind (plotting survival, lusting after women) — deprived of access to the character’s thoughts, Lester has to create comedy by letting McDowell play Flashman’s weakness more on the surface. Since he’s not an imposing figure next to Bates and Oliver Reed, you don’t get the same shock effect from seeing McDowell crumble into craven hysterics that you might if Tyrone Power were in the part. McDowell instead brings a light comedy flare, and though he can evoke strutting arrogance well it’s peacock-like rather than leonine. Fraser’s lively prose, punctuated with period slang, can be suggested in the dialogue, but otherwise Lester is forced to create comedy out of slapstick accidents, which disrupt the romantic spectacle as in his MUSKETEERS films, but are slightly less suited to the purposes of Fraser’s world. Reading Flashman it’s intriguing to imagine what Lester’s film would have been like, since the story is nastier and darker than anything in Royal Flash, and the horrific elements that surface in most of Fraser’s books with his protagonists encounters the dark side of history play a much smaller role in both film and book of ROYAL FLASH. It’s still a better film than its reputation suggests, I think. The true miscasting is probably Florinda Bolkan and not McDowell — she lacks comic flare and despite being more authentically “dago” (Flashman is a master of every racial epithet) than the real Lola Montes, she can’t muster a wholly convincing fiery temperament. What lets it down is the protracted ending. Fraser tends to let his books ramble on for the last several chapters, long after the climax is over, and this isn’t particularly problematic on the page since the deplorable Flashman is such infernal good company. In the movie, we get a very long and exhausting comic duel with Bates, which I enjoy a lot — Lester used very slight, undetectable undercranking for the swordplay, along with a device that allowed him to adjust the pitch of the soundtrack to prevent the leads from sounding like Chip ‘n’ Dale. With Ken Thorne’s mock-Wagnerian score going full blast, this rather batters into submission, but fails to actually conclude the film, with the chief villain escaping for a sequel that will never come. By now we’re ready for a long rest, but instead of closing credits we have a series of several fully-developed scenes rounding up the storylines of Bates, Reed, Bolkan and Britt Ekland. Most of these are necessary, but they’re cumulatively too long. Still, overlook that and there’s much to cherish. Ben Aris performs one of my favourite ever pratfalls after he’s hit with a champagne bottle at the christening of a locomotive — a tall man in a tall hat wavering, stunned, like an undulating soundwave, before cascading to the ground. Flashman’s scarring at the hands of Otto Bismarck and his cronies is authentically nasty and shows an ability to handle the darker aspects of the story — as in CLOCKWORK ORANGE the repugnant hero is treated so appallingly at times that we become horrified by our own sympathy for him. 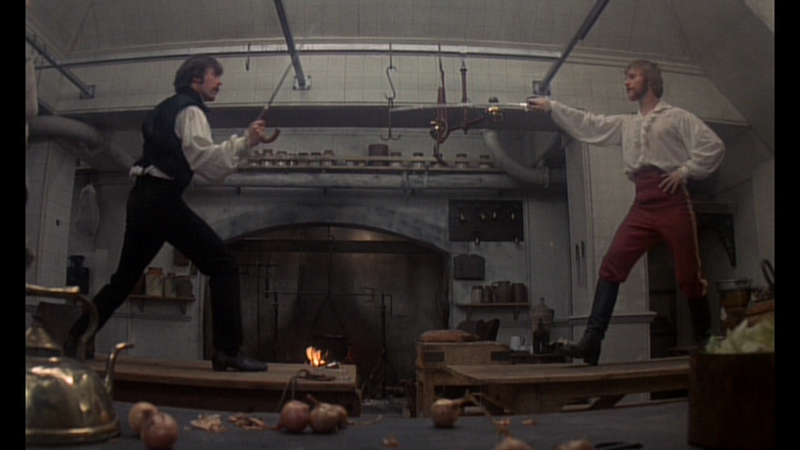 The knockabout kitchen duel between McDowell, Tom Bell, Lionel Jeffries and Alan Bates is spectacular. Geoffrey Unsworth’s filming of Bavarian palaces is ravishing, as is Terence Marsh’s production design, full of Victorian splendid gadgetry like the foot-pedal-powered shower at Flashman’s club (where he meets Alastair Sim in one of his last roles).